It is evident after understanding the meaning of Education and Psychology that Education is a social process, whose objective is to transform the human behavior and Psychology is such a science that is related to the study of behavioral changes. This is the behavioral form of general Psychology. The Educational Psychology studies the various aspects, related to the action of the learner and learning, and teacher. Educational Psychology is an important branch of Psychology. This is made of two words-‘Education’ and ‘Psychology’. It means the Education related to Psychology i.e. it is scientific study of human behavior in the process of Education and it uses Psychological principles in solving the Educational problems. In the words of Skinner-“Educational Psychology takes its meaning from Education, a social process and from Psychology, a behavioral science.” The behavior of man is changed by Education and Psychology is such a science that studies all the aspects of human behavior. In this view, Education and Psychology, both are related to the development of human personality. The basis of Educational Psychology, Psychology deals with the rules and facts of human conduct. In the same way Educational Psychology deals with the specific kind of people, the behavior and conduct of students either getting education in school or outside school. Its scope is extremely narrow and specific. Educational Psychology utilizes procedures of General Psychology for the study of its subject. It deals with the qualities of children, nature and their behavior in educational situation and represents the solution, analysis and explanation of education related problems. In the words of Skinner, ‘’Educational Psychology utilizes those findings that deal specifically with the experiences and behavior of human being in educational situation. Educational Psychology studies those processes that affect human behavior. Psychology, not only expounds its principles, but is also tells us how life could be made healthier and prosperous using its principles. Psychological principles are used in dealing with the various problems and situations of daily life. An educational subject is important in this specific field. Since the different principles and the rules of psychology are applied in Educational situations therefore the Educational Psychology is also called the behavioral Psychology. What is Educational Psychology? What does it mean? It will be clearer with its description related to various definitions, objectives and scope. On the basis of above description we can say that educational psychology is the psychological study of students’ problems and their solutions that arises in the educational environment along with the responses toward educational environment. It has been widely explained in “Encyclopedia of Educational Psychology”, in learning, is related with human element. This is such a field in which the concept are applied in the filed of education that are gained after experimental work done in laboratories. However this is such a field as well, in which, the experimental work is done to determine the procedures of studying the behavioral of such concepts and special interest in education. It studies the various sections of learning that are directed to prevent a student in adapting to the society with the optimum security and satisfaction. Nature of Educational Psychology—On the basis of the above definitions, the nature and structure of Educational Psychology could be discussed. The nature of the Educational Psychology is considered to be scientific. It becomes clear from the study of Educational Psychology that the principles of psychology are applied in the filed of education. Today Psychology has proved valuable in educational processes. With the help of psychology, the scientific principles pertaining to the rules of learning, concentration, tiredness, ways of memorizing, the principles of syllabus structuring, learning and its evaluation are studied. Therefore, from the angle of Educational Systems, the nature of Educational Psychology, like Psychology, could be considered scientific. 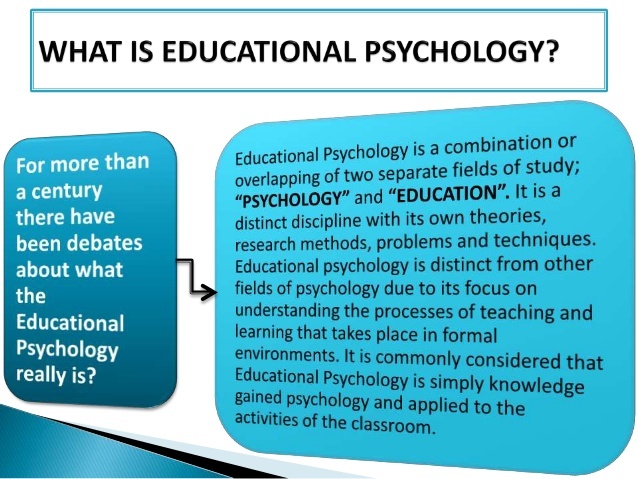 Educational Psychology establishes its general principle by the scientific study of its problems and their solutions and predicts the person’s behavior related to the subject of learning. The various methods of Educational Psychology shall be described further. Now a days there are many researches are being done in the ﬁ led of Educational Psychology for the teachers, counselors and all the procedures of schools, as well as to understand the human nature. Educational Psychology is considered to be a behavioral science because it describes the process of education on the basis of fundamental principles of human behavior. Educational Psychology is also a major behavioral science. It also studies the ‘what’, ‘why’, and ‘how’ of human behavior. It explains the process of learning in its surroundings scientifically. The thoughts of psychologist Crow and Crow are, “Psychology explained ‘how’ of human development as related to learning education attempts of provide the ‘what’ of learning educational psychology is concerned with the ‘why’ and ‘when’ of learning.” Thus, as per Crow and Crow, Educational Psychology can be considered a behavioral science. Because it attempts, to explain the processes of learning established by scientific methods related to the human behavior in context of learning. Educational Psychology is of scientific nature. Even under this, a scientific and systematic study is done for students and their behavior in context of the learning environment. At last we can say, Educational Psychology is the science that studies the education according to the principles of psychology. Although Educational Psychology is a branch of Psychology, yet it delivers it principles independently by resolving the educational problems on experimental basis and on the basis of these principles, studies the human behavior in the educational situation. This procedure also affects the learning process. Regarding Educational Psychology, most of the educationists think that it has now become an Independent Discipline. As it is evident from the following excerpt. “Today’s Educational Psychology does now apply the general principle of Psychology as it is, but it also applies it into day to day activity to testify and after the experiments it presents its principles separately. Therefore modern Educational Psychology has its own scope, programs, problems and methods. All of these activities show a relationship with the general psychology however they are not dependent on psychology.” It is related to Psychology on one hand and to Education on the other. Education discipline has close relation with Educational Psychology as it is compulsory to study Educational Psychology with it. Hence we can say that Educational Psychology is a social science of Education Discipline. Educational Psychology focuses itself on human behavior. It is a body of facts and information which are found as a result of Investigations and Observations. This body of knowledge can be generalized in form of principles and rules. Educational Psychology has developed a new system in which knowledge is searched, hypotheses are testified and principles are expounded. This system is helpful in solving the problem that arises by them. These information, knowledge, principles, and systems all make up Educational Psychology and provide the basis for Educational Theory and educational conduct. Educational Psychology as an Occupational Subject—The teacher is a major factor in Teaching and learning process. Hence it is important for one who would become a teacher and adopt teaching profession, to study Educational Psychology. In this way, Educational Psychology can also be addressed as a professional subject. This is described in detail in ‘The Scope of Educational Psychology’.